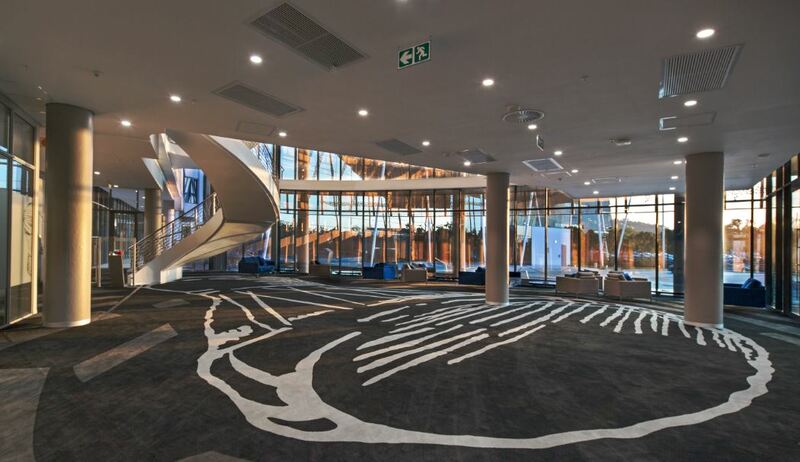 The interiors of the new Statistics SA (Stats SA) building in Pretoria was designed to reflect the pulse of Africa in a masterful interpretation of how statistics can help build a better future for South Africa. Every design element – from the architecture to the interior finishes – was carefully crafted to reflect the cultural heritage of the site, as well as the company’s activities. Belgotex Floors worked with Rosanne de Castro of GLH Interiors (Grosskopff, Lombard, Huybrecht & Associates) to develop beautiful flooring for the three-storey building that incorporates various cultural symbols and metaphors. An enormous African drum on a plush custom-designed carpet heralds your arrival at the central atrium. The drum, which is the logo of Stats SA, symbolises the rhythm and reverberation of the company’s beat on the nation. Produced using the intricate pattern technology of Belgotex Floors’ exclusive Tuftweave programme, this flooring masterpiece makes a bold statement to their 3 000 staff and visitors. The hand-drawn drum, in classic grey and black tones, features a symbolic tally-stone “criss-cross” mesh that further depicts counting. Designed using Belgotex’s sophisticated graphics software and produced on their hi-tech CMC machines – the only ones of their kind in Africa – each tuft of yarn was individually placed to produce exceptional pattern detail and colour definition. The building’s five wings or “fingers” were connected by a duo-tone combination of textured loop-pile carpet tiles. The warm earthy linear patterns of Equinox in Leo were used for the open plan offices, while the darker charcoal shades of Taurus were used in the passages. Fifth Avenue in Diesel was laid in the auditorium and training centre, satisfying the areas’ sound reduction and low maintenance requirements. The pulse of the people reverberates silently through the striking “total” blue broadloom carpet with the bespoke tally-stone design in the executive boardroom and dining room – the true heart of the organisation. For more information, contact Belgotex Floors on +27 (33) 897 7500 or via www.belgotexfloors.co.za.